Eugene Yelchin. | What is ML Reading? 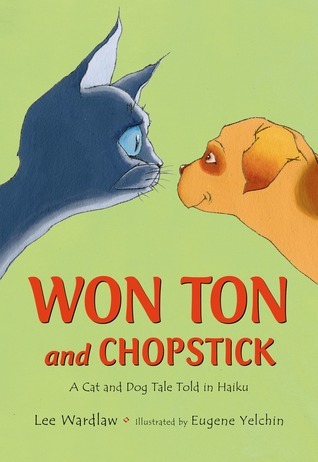 In Won Ton and Chopstick: A Cat and Dog Tale Told in Haiku by Lee Wardlaw and illustrated by Eugene Yelchin, created an ingenious way to explore the challenges of a puppy introduced to the old pet, a cat. The illustrations evoke the jealousy of the cat and silly innocence of the puppy. The rhythm of haiku compliments the overall story. It’s hard to pick a favorite among these expressive and entertaining poems. Here’s a small taste from this outstanding book. I said him, not me! A remarkable introduction to big words with understandable context clues… suspicion, altercation, banishment, adjustment, vindication and harmony.